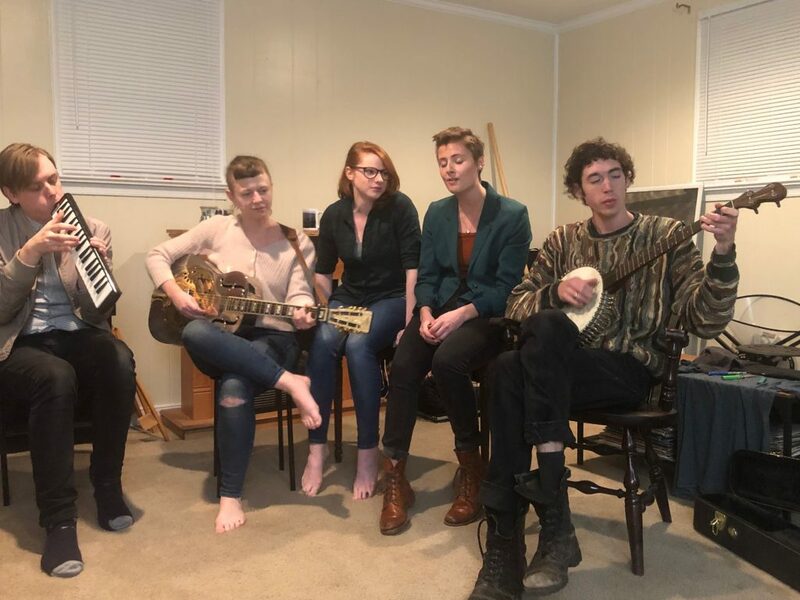 The newly-formed local folk ensemble is grappling with powerful emotions like loss and grief through the healing power of old-time harmonies. Sitting together in a circle, one band’s practice looks more like an old-time country jamboree than a rehearsal. Laughs are passed between them as they talk and tune their instruments by ear, plucking a string here and there and humming along. With her homemade guitar, Charlotte Jones picks out a tune and belts out the words to a song she has written. Tapping her bare feet along to the tempo, her voice is mirrored in harmony by her fellow band members. The southern sound coming through is a composite of country, folk, and bluegrass, reminiscent of folk singers like Emmylou Harris, Linda Ronstadt, and Gillian Welch. With Charlotte Jones on guitar, sister Hannah Jones and Laura Crowley on vocals, Stephen Roach on piano and melodica, and Aaron Staples on fiddle and banjo, Charlie and Darlings is using their focus on layering harmonies, lyrical content, and unique instrumental sound to deal with loss, grief, and atonement. For lead vocalist and songwriter Charlotte Jones, making their latest project has been a cathartic release. In a span of 3 months, Jones lost three friends and a relative in unforeseeable ways. Unfortunately, Jones’ misfortune was not over at that point; shortly after, she was involved in several bad car accidents, including one with sister and fellow band member Hannah Jones. This trauma placed significant strain on Jones, and as a way to cope and understand concepts of grief and death, she began writing songs. Charlie and Darlings latest project is an album composed of four waltzes that the group has called “sads songs you can dance to,” all of which written by Charlotte Jones. Pairing lyrics that describe watching one’s heroes cry, thinking of those lost in mundane aspects of life, and trying to cope with memories with upbeat instrumental arrangements, Charlie and Darlings intentionally match sad lyrical content to upbeat music, juxtaposing grief with the warmth that comes through harmony. According to the band, this is in order to bring focus onto the lyrics themselves, and to let the emotions come through. The upcoming album will pay tribute to those who the band lost and to the deceased’s families. Jones said she wants to include a ‘pay it forward’ aspect to the album so those who were lost can be honored. The five members of Charlie and Darlings share a sense of camaraderie that transcends into their work. Different walks of life have brought them together but they act as if they have known one another for a lifetime. Sitting hip-to-hip on a small piano bench, Laura Crowley and Hannah Jones pass smiles of affirmation to one another mid-song. “I wanted a solid base of folks and musicians for the band and it just so happened they’re my best friends,” Jones said. Charlie and Darlings will perform on March 29 at Crossroads located at 3600 Forest Hill Drive in Richmond.